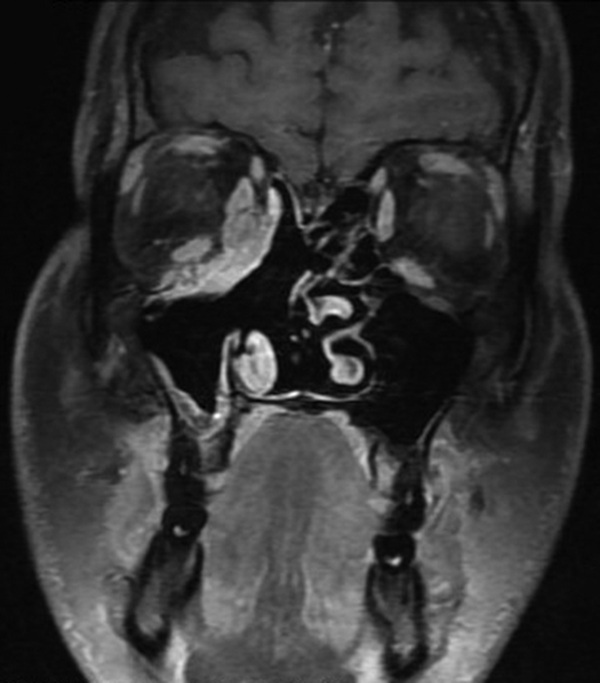 A 24-year-old male patient who presented with a history of right nasal obstruction, right eye pain, lower eyelid swelling and orbital swelling. 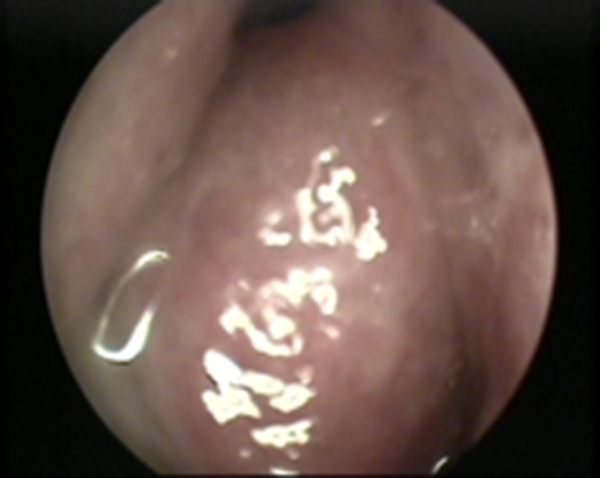 Endoscopic examination revealed an obstructive mass occupying the right nasal cavity. Cranial nerves were intact. The result of hematological and biochemical investigations were within normal limits. 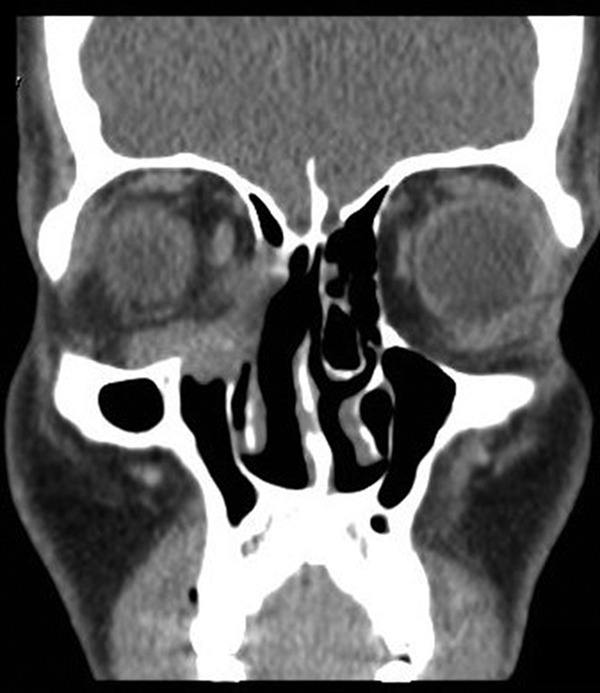 On radiological evaluation, CT scan with contrast of the paranasal sinuses (PNS) revealed a mass involving the right ethmoid sinus with medial wall and orbital floor extension. The subsequent magnetic resonance imaging (MRI) revealed an infiltrative soft tissue mass occupying the right ethmoid sinus, eroding inferior-medial orbital wall and extending to the extraconal space. 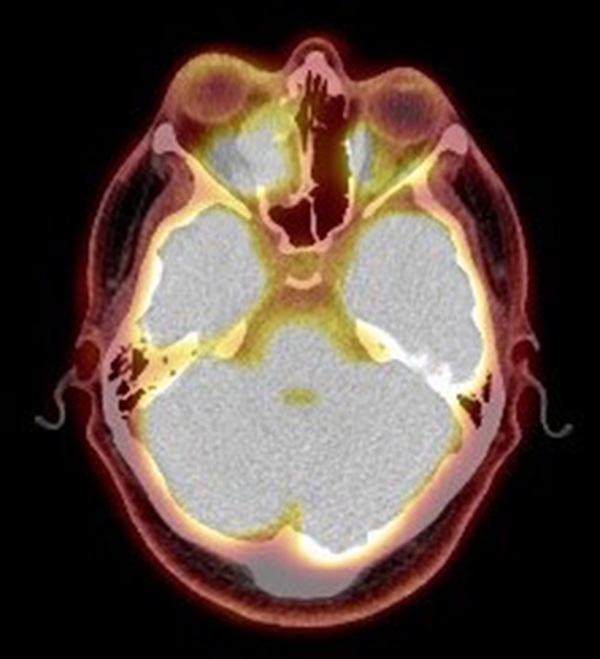 Positron emission tomography (PET) scan demonstrated an ill-defined 4.5 × 4.2 cm2 mass lesion in the right nasal cavity and ethmoid sinus extending to the right medial orbital floor. The scan did not reveal any associated lymphadenopathies. Histological analysis of a biopsy from the mass revealed a small rounded blue cell tumor suggestive of Ewing’s sarcoma/primitive neuroectodermal tumor. Immunohistochemistry showed the neoplastic cells are positive for CD99, S-100 protein and vimentin. However, neuron specific enolase (NSE), smooth muscle actin (SMA), desmin, myogenin, CD45, synaptophysin and pan-cytokeratin were all negative. KI-67 index was 30–40%. Subsequently, molecular study using fluorescence in situ hybridization (FISH) had shown rearrangement of EWSR1 gene in 100% of the analyzes nuclei that confirm the diagnosis of Ewing’s sarcoma. The patient underwent endoscopic excision of the tumor followed by chemotherapy and radiotherapy treatment. MRI 6-months post treatment showed complete resolution of the disease. The patient remains symptom-free during 2 years follow-up and maintains a very good quality of life.